In an earlier post, I had discussed the similarities and differences between a North Indian and a South Indian Kadhi (Buttermilk Curry). I shall not go into that here. But before going into the recipe I want to note down a two things that a non-kadhi-expert should always keep in mind while making either version of this "apparently" simple dish from India. One. Follow a good recipe. Though Kadhi seems like a fairly simple and intuitive dish, unlike most Indian dishes it is not. Measurements and following step-wise instruction is the key to a really good Kadhi. While Laxmi's recipe (the one given below) is a good one for South Indian Kadhi, for a North Indian Kadhi I highly recommend the recipes by Tarla Dalal. 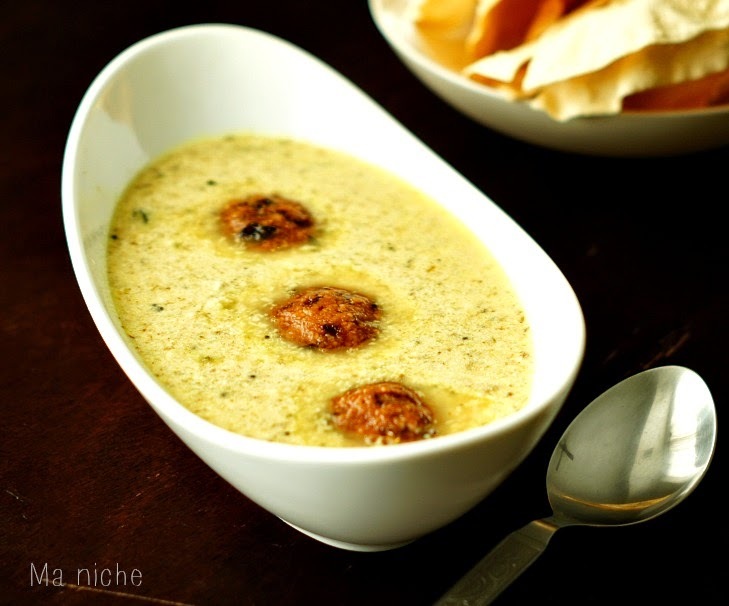 Those are the Kadhi-Man's, that is, my husband's favorite. Two. Whether you are cooking a South Indian Kadhi with ground rice and coconut paste as the thickener or a North Indian Kadhi with besan or chickpea flour as the thickener, reduce the flame to low after adding the buttermilk to your pot and simmer the curry for a while before turning off the heat. Excessive heat causes the buttermilk to curdle. You do not want that ! So by all means cook kadhi only when you have enough time in hand. You cannot rush through this "delicacy." Three. Well this one is obvious and is kind of covered in point one and two. Cook and simmer until the raw smell goes away. A newbie often tends to overlook this point, so I thought I'll mention. This is how your kadhi should not look. This photograph is from a previous attempt when the yogurt curdled. Soak the chana dal for 2 hours. Drain and along with 2-3 dry red chillies, grind it to a coarse paste. Do not add water and do not grind into a smooth paste. It is fine if a few pulse remain whole. 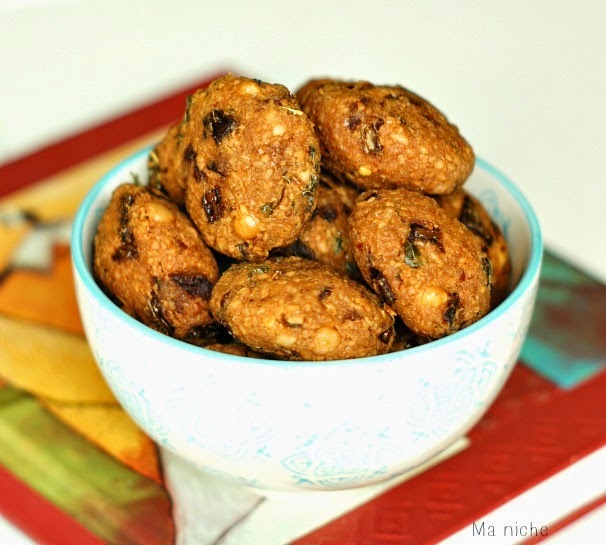 Add the fenugreek leaves, crushed garlic, curry leaves and chopped pearl onions to the ground mixture, mix well, season with salt and shape into lemon sized vadas. Heat sufficient oil in a wok and deep fry the vadas . 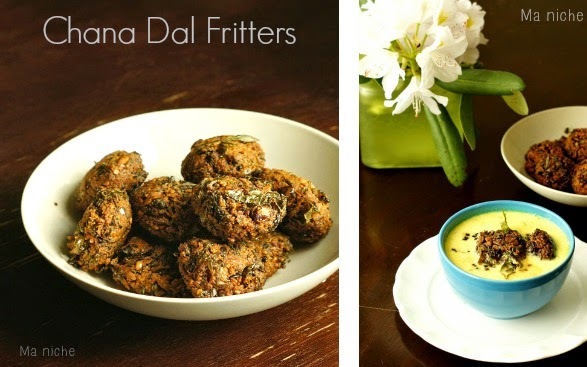 Flip the vadas in between and fry until they are golden brown. Wash the raw rice and toor dal and soak them together for an hour. Drain, then adding a bit of water grind the soaked mixture and keep it aside. Add the yogurt and water in a bowl, beat them together until smooth, then keep aside. Heat 1½ teaspoon of oil in a medium sized pan. When the oil is hot add the rice-toor dal paste and fry for a couple of minutes. Then add the coconut paste along with turmeric and asafetida and fry for a minute or two. Add some water and bring to a boil, then simmer and cook for a couple of minutes until the raw smell is gone. Now stir in the yogurt-water mixture, reduce the flame to low and simmer. The recipe suggests simmering until tiny bubbles begin to appear along the edges. Note that, no bubbles appeared in my pot of curry even after simmering it for 30 minutes. However I could hear a soft bubbling sound and the curry looked done. So I switched off the heat after 30 minutes. Next in a pan heat 1 teaspoon of coconut oil. Add mustard seeds to it. When the seeds begin to splutter, add dry red chilies, chopped ginger and curry leaves. Cook for a few seconds then pour the seasoning into the curry. Add the vadas to the pot of curry just before serving. Serve it with steamed rice and a fry. 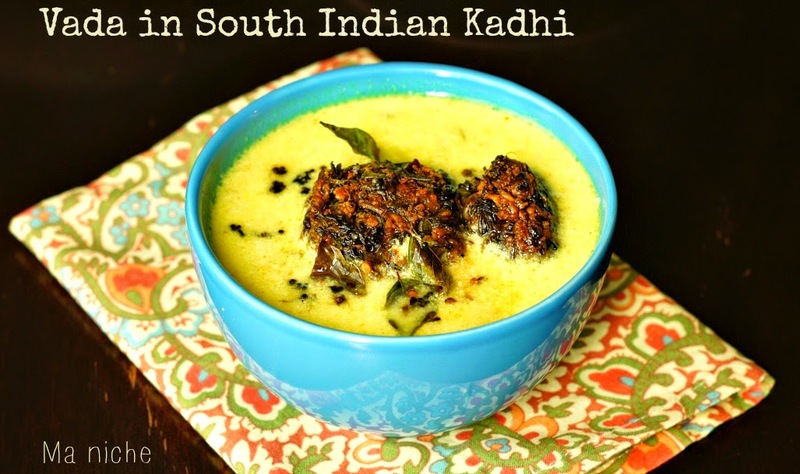 An elephant yam fry or an Indian style baked potato or even papad are great sides with this kadhi. But if you are looking for something seasonal, try some asparagus stir fry. Pretty sure you won't be disappointed ! Fry the vadas while the curry simmers. For a pro this is obvious but a newbie might need pointers. Thanks to Divya of You Too Can Cook and Laxmi of Samayal Diary for the SNC challenge. This was a great recipe ! Linking it to Samayal Diary and also sharing it at these weekly parties. 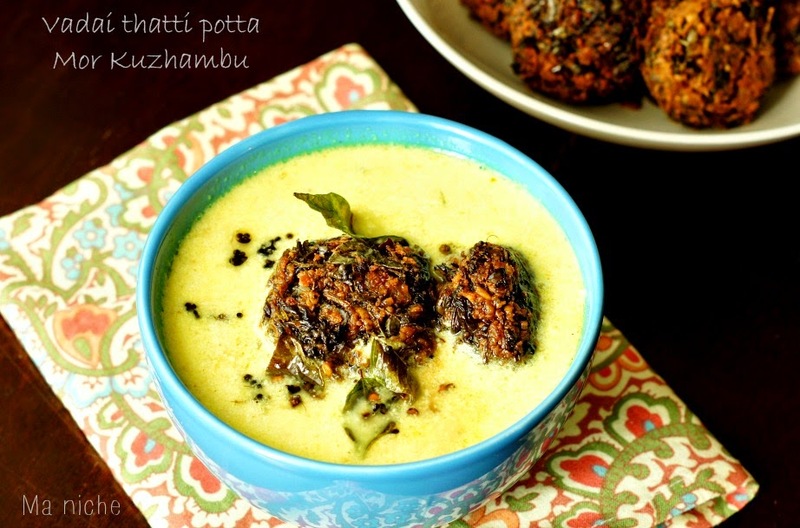 i have a thing for Kuzhambu and this one a must try. I love curry, but I have never had buttermilk curry before! This looks great, I've never had a curry with buttermilk in it before. Thanks for linking up to Sweet and Savoury Sunday, stop by and link up again. Have a great day!! when ever you prepare curry from curd or butter milk. Mix all the things nicely or even use blender for this purpose. And then do the cooking and tempering of curry. Its like mix all the ingredients together, blend well and then follow the cooking process. Thanks for your tip. I'll keep it in mind while cooking Kadhi. Thanks again.